Summer in Oaxaca is very special. The days are pleasantly warm with the occasional afternoon shower, the light is particularly beautiful, and the streets are filled with excitement at the approach of Guelaguetza - the colorful folkloric dance that has been performed for centuries in this southern state of Mexico. Also known as Lunes Del Cerro (Monday on the Hill) Guelaguetza has its origins in pre-Hispanic times when it was an occasion for gift-giving and ceremonies in honor of the Corn Goddess. 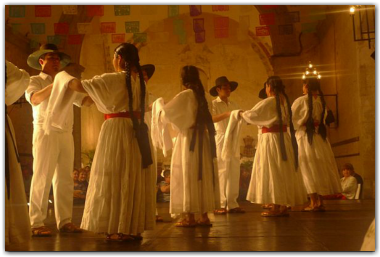 It has been observed since 1932 when Oaxaca celebrated its 400th anniversary. Groups from many regions of the state perform their wonderful native dances in all varieties of costume. What better time to join our 6-night 7-day workshop. Because we limit course size, we can provide individual attention whatever your level of experience or expertise. Learn first hand about the fascinating and rich culture of this traditional southern Mexican state by interaction with people who live here and from the knowledge of artist/ instructor Humberto Bastista. Visit an indigenous market, explore pre-Columbian ruins, discover Oaxaca's museums and galleries, and spend a day learning Oaxacan cuisine at Susana Trilling's Seasons Of My Heart Cooking School. 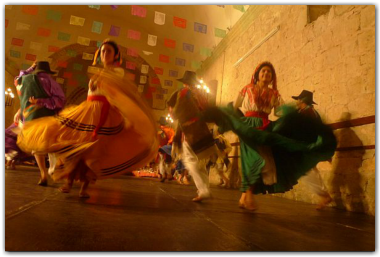 And of course we'll attend the annual Guelaguezta festival with "the best seats in the house!" The price is $1,495 This includes six nights hotel accomodation (double-sized room with private bath--no extra charge for single occupancy), our banquet, your day at the Seasons Of The Heart Cooking School (transportation included), and tickets to the Guelaguetza.